Photographs that have been scaled with these software have been degraded (see the examples). The degradation is often faint but probably most pictures contain at least an array where the degradation is clearly visible. I suppose this happens since the first versions of these software, maybe 20 years ago. If you would like to see how your browser scales the image, click here. To get a smoother image tuned for TFT displays, click here. When I showed him the examples below, a friend who is a photographer told me he had noticed that error since a long time and lots of his colleagues did. They never could word or understand it. It made them loose a lot of time and caused much frustration. What about the digital age preserving the information? My friend tells me that professional argentic scalings didn't cause such errors. He believes that the problem is mainly due to the fact that the teachers of photographic art in the academies do not understand this technical item. If they did, the main manufacturers of software would have adapted, because there would be a motivated demand. Other people have reported that the gamma caused them serious problems, like a webmaster that was confronted with darkened image thumbnails or a cartoonist who could not get his drawings handled properly. Not only professionals complain. This is a comment from a sensible user: "while drawing on the computer using GIMP and Photoshop, I found that results often look too dark, but I always thought I'm just hallucinating." Technically speaking, the problem is that "the computations are performed as if the scale of brightnesses was linear while in fact it is a power scale." In mathematical terms: "a gamma of 1.0 is assumed while it is 2.2." Lots of filters, plug-ins and scripts make the same error. 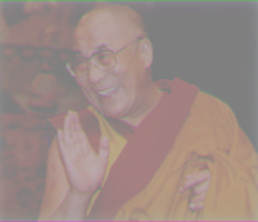 A strange case would be that of ACD Canvas X running on Windows XP SP3: the Dalai Lama picture appeared scaled correctly on the screen but when that image was saved in JPEG format and then re-opened... it was gray. This was done by MS Paint in Windows XP. Some web browsers do the same. The image could also have been green or checkered green and magenta. In most cases the image will be less blurred than this one. The explanation is that the scaling is not performed by computing out an average of nearby pixels, but just by picking out 1 out of 4 pixels in each 2x2 pixel box. This is the most simple and fast way to scale a picture but it often yields obvious problems. It's "downsampling with no antialias filter". This was done by Photoshop (look closely; slight green lines). Recent versions of Firefox do the same. 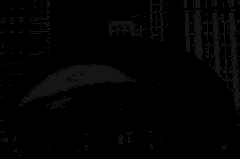 The explanation is that the above technique was used; picking 1 out of 4 pixels, but first applying an antialiasing filter that blurs the image and hence makes an average of nearby pixels. That yields the faint green lines. On the other hand, there never was a gamma problem within the printing or the movie industry. They have defined tight and scientifically-grounded standards and procedures and they perceive the public software tools as toys. (Note, about this, that some of the tools mentioned here yield incorrect results when they are used bluntly by amateurs, but when used properly by trained technicians they behave perfectly.) The medical and scientific data collecting systems also use precise protocols, yet there may be cases where the analysis is performed on display systems that distort the data. This can prevent a specialist from making an optimal evaluation. The two pictures above were scaled down from a huge size to just a thumbnail, which increases the damage. Also, I had to scale down 20 huge images to get those two where the damage was blatant. It was clearly visible on most of the 20 images, but not as much as on these two. But... look at the animation below that continuously swaps between the two pictures. See how more light the correct scaling has. Knowing that difference, even if you wouldn't notice it, do you accept it? Dithering? These two examples from Sam Hovecar show how standard software mix with the gamma and how the routines written by Sam do it the right way: example 1, example 2. What about simply merging images? Thomas Troeger sent the three pictures below. The first two show a merge between a horizontal and a vertical gradient; ( + ) / 2 = . The first one shows the correct merge. The second one was made without linearizing. The third image shows the difference between the two images, whiter meaning that the error is worse. If you'd like an animated comparison between the two merges click here. For the source code in Python, click here. By some coincidence, cannonballs of type number 1 have a weight of 1 kilogram. Cannonballs of type 8 have a weight of 8 kilograms. Why not... But this does not apply to the other types. Type 5, for example, has a weight of 3.1 kilograms. It is very important to account for each cannonball leaving the armory. Especially, it is mandatory to compute the weight of what left the armory. This is vital to keep the ship level! 1 x 1 + 3 x 2 + 2 x 6 = 19 "kg"
If you are using a common CRT display, the top three checkered squares may show different from the three striped bottom ones (especially the second checkered square). In that case, the striped bottom ones are the reliable ones. 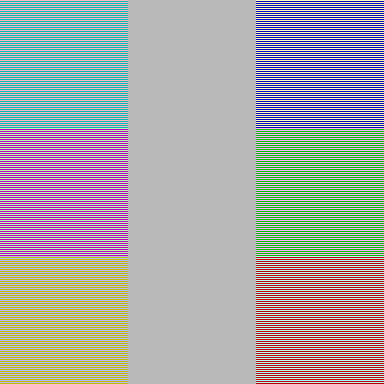 The second column of squares was reduced to the correct shade of gray. 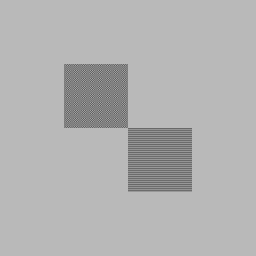 The eight squares keep showing the same gray. The second column appears much darker. If it does appear the same gray as the first and fourth columns, your system is out of calibration (believe me). It may also be that if you reduce the picture with your own software, the first and fourth columns are no more made of black and white pixels but of shades of gray. One could say that your software made an error but for such things it is also a matter of preferences and choices. Why did the second column get darker? The problem lies in the gamma. Explanation follows. 255 divided by 2 equals 127. At first thought you would believe that gray number 127 has half the luminosity of gray number 255 (=white). That would be a "linear" scale. 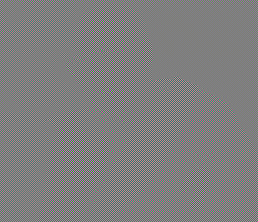 Actually, the gray that shows half the luminosity of 255 is gray number 187. This is due to the "power" scale being used. This all, to explain that gray number 127 does not imply a luminosity half that of number 255. Gray number 127 implies that the power of light emitted by the screen must be 21% of the power of bright white. 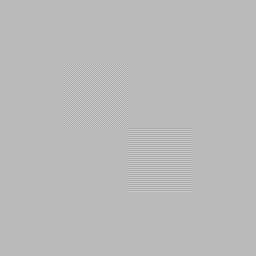 Conversely, the number of the gray that asks for 50% power is 187.  That gray pixel is supposed to have the same brightness as the global result of the former four pixels.  Those four pixels being two pitch black and two bright white, the mixture of them yields 50% of the energy of bright white. That is gray number 187. 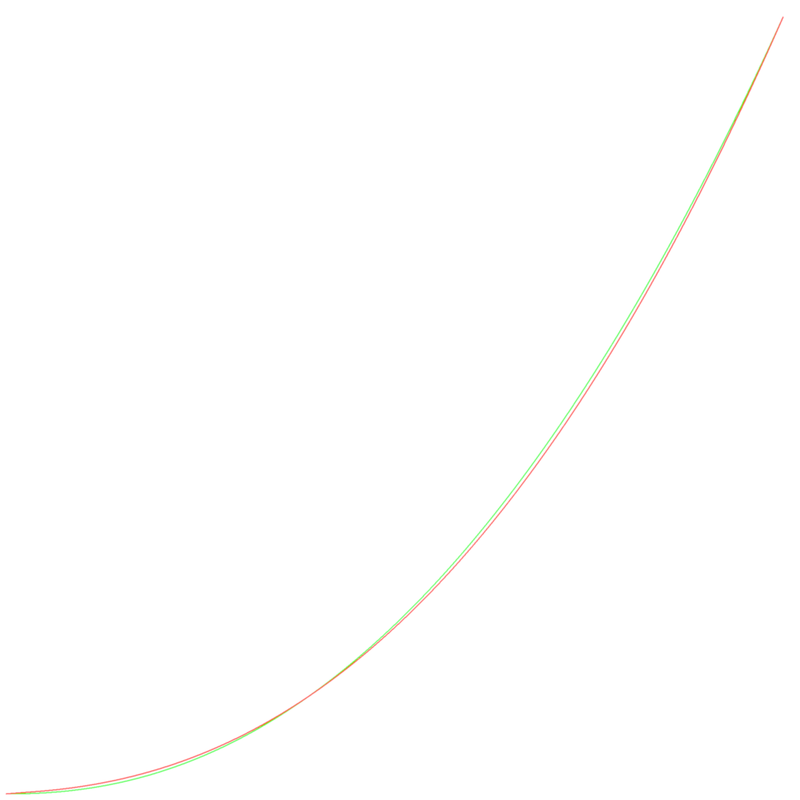 The error made by many scaling algorithms is that the mean value of the numbers is computed, instead of their luminosity. This yields 127 or 128, which shows 21% light power, which is a gross error. This error is made also when the picture size is increased (I didn't verify this). Whatever the brightness of the pixels being merged or expanded, the error is made and yields more or less drastic damages. 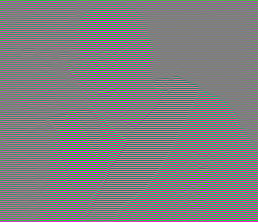 Some pictures, like fuzzy photographs, are almost not degraded by this error. Sharp pictures with tiny contrasted details are quite damaged. Jonathan Carroll sent this picture with two dithered scales of gray, that allow to test the problem for the whole range of brightnesses. The image needs to be displayed 1:1. The middle scale aligns the shades from number 0 to number 255 in order. 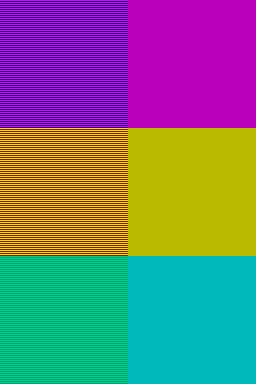 The shades in the middle are number 127 and number 128. 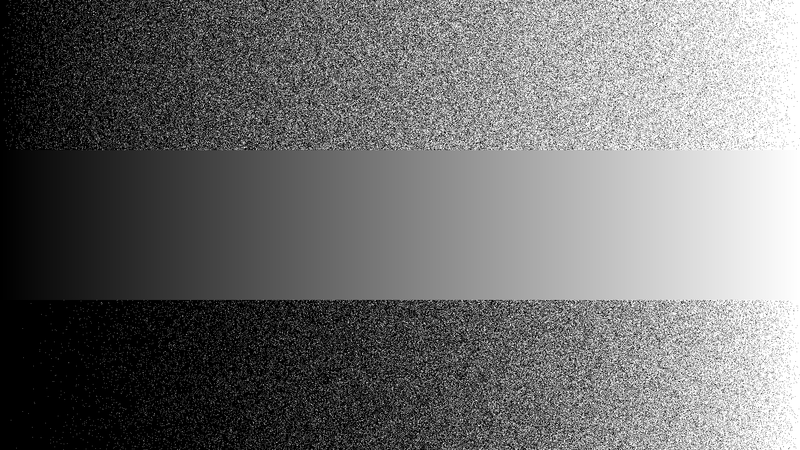 The two dithered scales are made of only full white and full black pixels. Yet the top scale is made with the correct gamma formula in mind and will ensure that the average brightness is the same as in the middle scale. This means that in the middle of the scale there are not 50% white and 50% black pixels. The bottom scale on the contrary, uses 50% white and 50% black pixels in the middle, which is obviously erroneous. If the image is resized down properly, the top and middle scales will appear identical. Don't be fooled by the fact that the curves seem almost identical. 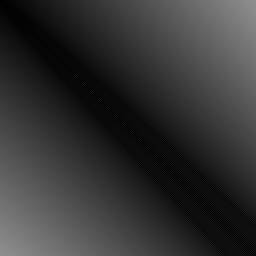 Gray number 1 is 60 times brighter by sRGB than by the simple gamma curve. Gray number 8 is 5 times brighter. This will not make any noticeable difference in most cases but it can, for example when a very dark picture is handled. It is perfectly allowed to use any other formula to encode an image or no formula at all... But then something somewhere must say or imply that the image must be handled a different way. Either the format of the image implies it, or the encoding of the image contains that information, or *you* know it and you impose it to the software every time you handle the image. Or possibly the default behavior of the software is intentionally to assume no or the intended encoding. Whatever... As long as in fine the computations are performed on the correct values of the luminous power of each pixel. A quantity of red, between 0 and 255. A quantity of green, between 0 and 255. A quantity of blue, between 0 and 255. Those three quantities of primary colors use the exact same power scale as explained above for grays. Hence colored checkers or stripes undergo the same degradation by lots of scaling software. It's not just a matter of brightness, like for the grays. If an array of a picture tends to be made of fine details in one primary color and flat in another primary color, the color of the details and the overall color of the array will change drastically. The test pictures that follow are best viewed with a CRT display or a quality TFT. Low-cost or laptop TFT displays will show nonsensical colors unless you calibrate them an look at them from a perfectly perpendicular angle. At first I thought the brightness and contrast filters too made the gamma error. Then I learned and realized those filters are quite loose in essence. Their principle dates from a time when their electronic counterpart in the early television sets played directly with the gamma curve. What is currently being called "brightness" or "contrast" can be almost anything, so it's difficult to pretend one implementation has the gamma wrong, since the implementation as a whole can be seen as wrong. In CinePaint the brightness tuning adheres to the system used in televisions. It adds the same value to the numbers of every shade of gray. Say 0 becomes 40, then 30 becomes 70, 200 becomes 240... just add 40 to all. That seemed heretic and oversimplified to me but actually this *is* the way television sets behave, for the same reason of electronic simplicity. Yet there is a problem for color images. CinePaint bends the colors to achieve an illusion of high brightness. Indeed a television set can bring the brightness to its extreme and maintain the colors. CinePaint, on the contrary, is limitated by the fact that each primary color channel has a maximum of 255. To increase the brightness when one primary channel already is at 255, they choose to increase the other channels. To prevent there be a visible transition when one color reaches 255, the trick begins already before... Again, this simply is a choice, that meets needs. Improvements in image encoding will allow to avoid such tricks. A first problem I have with these brightness tunings is they depend on the gamma being used. They won't give the same result on a picture with a gamma of 1.8 and a picture with a gamma of 2.2. A second problem is those algorithms are all different. It is not sane that the brightness filter in different software behave a quiet different way. The brightness filter in The Gimp (tested before 2.10) has the disadvantage to be unreversible by itself. You cannot reverse the effect of an increase in brightness by a decrease. I have no direct objections against those filters. Simply I believe they should each get a distinct name. The way they operate should be explained clearly. For example almost nobody knows what their parameter means. And they should be available altogether on every software, with their proper names. A more "absolute" set of brightness and contrast filters should be formulated, independent from the gamma and with simple and meaningful physical interpretations. I wrote two different "brightness" filters that have these particularities and have some advantages when used. For example they better reveal details in photographs. The way images are encoded must also be changed, to allow more liberty and security when using filters. For example I converted a photograph to 32-bit float encoding in CinePaint, then put it to maximum brightness, then reversed again to normal brightness. The picture was deeply damaged. This is logical but insane. Using an adequate high-precision encoding, I should have returned to the exact same image. In CinePaint, the contrast filter does follow the principle of the television set contrast. But just the principle. A big difference is a television set multiplies the signal starting from the black point. Say you double the contrast, then gray number 0 stays 0, 1 becomes 2, 7 becomes 14 and so on. CinePaint applies the same multiplication but using gray number 127 as a hallucinatory black point. So, 127 stays 127, 128 becomes 129, 134 becomes 141... and 126 becomes 125, 120 becomes 113. This is a choice that makes sense for digital photography. Except for the fact that the "black point number" should have been configurable by the user. And please explain to me why I had to type a contrast factor of 0.5 to get a multiplication of about 2. This all was observed using a grayscale picture, I don't know yet how colors are handled. 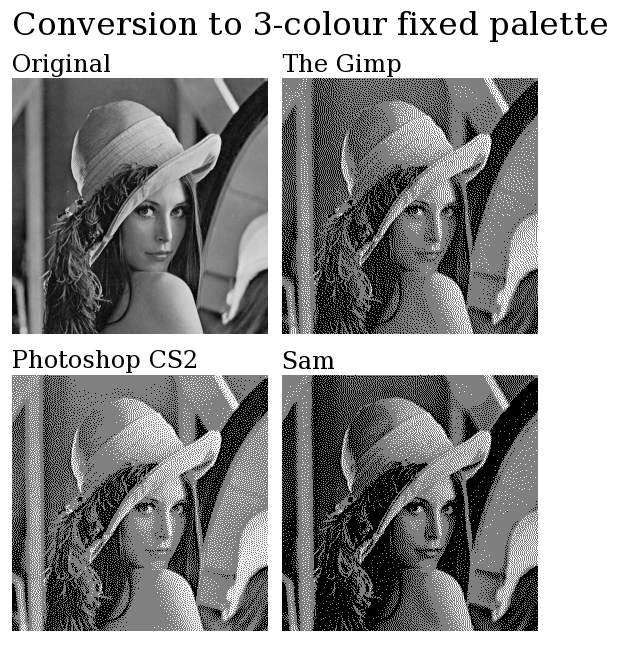 In CinePaint, the gamma filter is correct (tested on a grayscale image). I was just puzzled by the fact that it actually computes the inverse of the gamma you type in... To apply a gamma of 2.2 I had to type 0.4545... But the exposure filter, available in the same dialog window, makes the error. The principle of the exposure filter is "what if the photographer had exposed the camera sensor say two times longer?" You get a brighter picture... 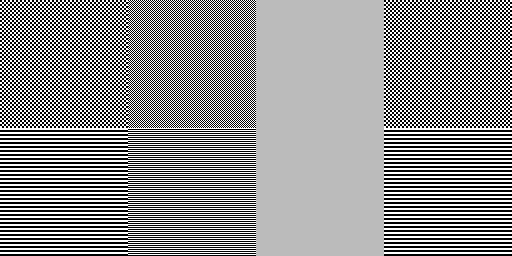 In CinePaint, gray number 0 stays 0, gray number 64 becomes 128 and gray number 128 becomes 255. As if it was a linear scale... Incorrect... Yet... this is the exact implementation of a television set contrast filter! Everything is mixed up... And by the way, why do I have to type an exposure filter parameter of 1 to get an exposure (incorrectly) multiplied by 2? Vector drawing software like OpenOffice Draw and Inkscape propose a "50%" gray. You guessed correctly: it's gray number 127 (128 actually). In this case the problem is less important. The shades are displayed and you choose the one that suits your feelings. Anyway I bet the developers thought that 50% gray has 50% luminosity. Bitmap scaling and gradient algorithms used by these software surely make the gamma error too. A friend told me that the PhotoPrint software makes error with the gamma. It doesn't print the test images of this text correctly. I tried to verify how museums scale the pictures shown on their web sites. One Guggenheim museum uses an algorithm that confers a kind of "plastic" look to the scaled pictures. The pictures are encoded in high quality but since they are transformed to get that "nice" plastic look I cannot compare. The Musée du Louvre uses a standard scaling algorithm, which makes the error. But the pictures are encoded in low quality JPEG, which makes even more damage than the gamma error. A friend who is in the business laughed at me and reminded me that museums simply don't care to provide correct reproductions. Only some specialized enterprises make an activity of using high technology to manufacture reliable reproductions. I tried to do the same on the NASA sites. Actually I could not compare the pictures correctly because the thumbnails inside the text pages seem to be made using very coarse graphical tools. The errors are much more important than the one I'm studying. Now then, those thumbnails don't pretend to have any scientific exactness and they are correct representations of what they link to. So I went testing the big scientific images that the NASA makes available to the public through its servers. Most often the pictures are available in two or more scales. All scaled versions I tested had the problem... Those scaled pictures were never meant to be used in accurate scientific studies and for lots of them the degradation is hardly visible. Besides, the original big picture is always proposed and it is also available in high quality TIFF format... If you need quality, you get it. Anyway I felt a little bit sorry. What about your pictures? Did you store your family photographs in their original files or did you scale them, did you tune something and threw the original away? How many amateur astronomers rely on inaccurate software to handle their photographs? Tell them you require a proper handling of the colorspace. Gimp 2.10 and later versions. The Netpbm toolkit for graphic manipulations, provided you use the pamscale command and you don't use the -filter option. 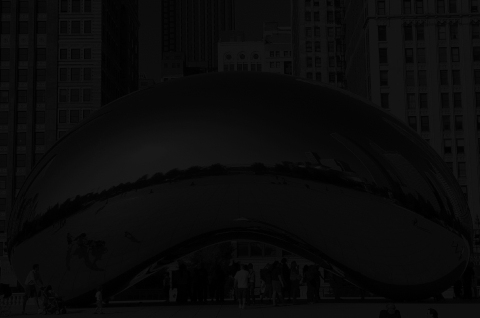 The latest version of Image Analyzer handles the image gamma correctly in some of the common functions: scaling, rotation, smoothing, inverting and grayscale conversion. The gamma can be set by the user but default is 2.2. The image exporters in Aperture 1.5.6 (but Aperture 3.0 won't scale images down correctly). Rendera, fromout version 1.5.6 at least (the previews are computed incorrectly). The Preview app in Mac OS X starting from version 10.6. The Acorn app for Mac OS X, if the Lanczos scaling algorithm is used. Adobe Photoshop Lightroom 2 and 3. Quark XPress 7.0 and 8.0. Tux paint (this is a great drawing software for kids, not a photo processing software). It seems GEGL handles images in 32 bit linear format, which is the ideal solution. It is not yet readily available to end users. cPicture (minute in size, huge in functionalities). GraphicConverter (starting from version 6.6.2b35; beta available here: www.lemkesoft.org/beta.html , release planned for March 15 ). Bibble, at least version 5. The current alpha version of RawTherapee but only when using the "Downscale" scaler. The ImageWorsener free command line tool. SAR Image Processor from www.general-cathexis.com . NUKE was designed from the ground up to work in linear space using 32 bit floating point. Corel Photo Paint X4 (and maybe CorelDraw). 32 bit depth linear encoding per color channel. A floating point linear encoding. 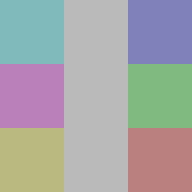 A linear color space, like XYZ (which implies 32 bit depth). Provided the image is now expressed in linear scale encoding with enough depth, every computation on the image will be correct. Convert to 16 bit/channel mode to minimize rounding errors (optional). Go to "Convert to profile" (in CS3, this is under the Edit menu). Select "Custom RGB" for the destination space. You will get a pop-up window asking for the parameters for your custom color space. In the options for setting up a custom color space, leave everything unchanged except set the gamma to 1.0. Press OK in the Custom RGB dialog box and then press OK on the Convert to Profile dialog box. Convert to your previous color space. If you converted to 16bit/channel mode, you may want to convert back to 8bit/channel at this point. The idea is simple: impose a gamma of 0.454545, work on the image, then impose back a gamma of 2.2. This is an approximation. 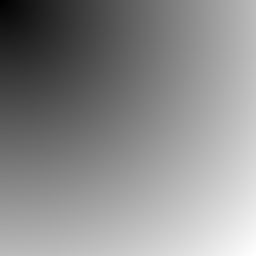 Imposing a gamma of 0.454545 is quite close to making an sRGB-encoded image linear. This will do in most cases... It should be perfect for photographs. But keep in mind that it is not technically perfectly correct. If you're working for the industry or on scientific data, you may get reproaches. These software are "not nice", because you have to perform all operations: convert to 16 or 32 bit depth, ask for a gamma of 0.454545, then at the end convert back to a gamma of 2.2... and the whole is not technically exact... Anyway it does the job. First of all a warning: ImageMagick is regularly being enhanced and transformed. What you read here is how things worked for me when I made tests with ImageMagick. Read it to get some understanding of the general ideas. But it may not work on the version of ImageMagick you are using. You may have to adapt. You can replace the "-resize 50%" with any set of operations on the image that you want to be performed correctly. I'm assuming that the image in file in.png is encoded in 8 bit depth and that I want out.png to be 8 bit too. If in.png is already encoded in 16 bit, then -depth 16 is useless. And if you want out.png to be encoded in 16 bit, then of course don't use -depth 8 at the end. Just for your information & skills, this is how I scale an image towards JPEG. The Lanczos filter is the sole one that's mathematically perfect (actually that would be the Sinc filter but Lanczos is a practical implementation of it). For example, if you scale up an image and then back to its original size, several times, only Lanczos and Sinc will keep the image identical. 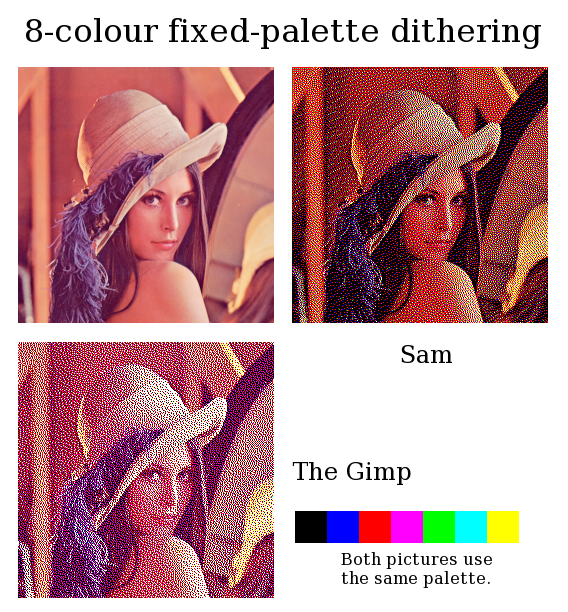 The -depth 8 parameter at the end was omitted because JPEG implies 8 bit depth. 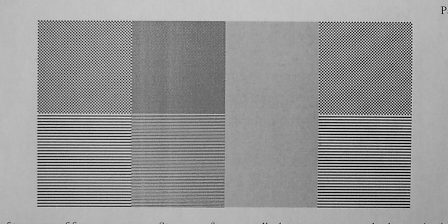 To end with, a quality factor of 95 and a sampling factor of 1x1 allow for an almost exact image with no color bleeding. On the version of ImageMagick I'm currently using, there is no need to specify -depth 16 either. It seems to be implied. 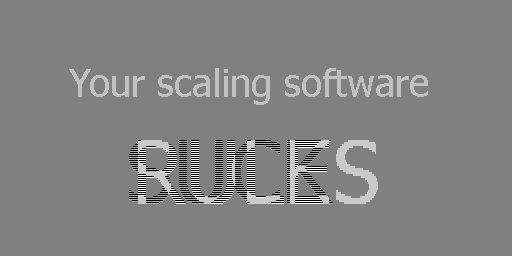 -scale (instead of -resize) will operate properly on some versions of ImageMagick. On other versions, only -resize will use the proper filter. Indeed -scale implies an older algorithm that does not take the -filter parameter into account. Best always use -resize unless you have a mandatory reason to use -scale. This problem was reported: "on a 256-color grayscale image, I found that the process inevitably reduced it to a 255-color image: color 1,1,1 dropped, becoming 0,0,0. That is a potentially significant loss, and one that those working on such images should probably be made aware of." Edit this image temp1.ppm with a software that can operate on 16 bit images, like CinePaint. Possibly combine it with other images you converted the same way to 16 bits and linear scale. Of course, one such software that you can use is the command "convert" itself. It has many possibilities. See its documentation. Save the temporary results of your work in files named say temp2.ppm, temp3.ppm... Still being in 16 bits and linear encoding. A tile_x of 2 means the image will be halved horizontally. A tile_y of 2 means the image will be halved vertically. This is a rudimentary scaling algorithm. It just compresses plain tiles of pixels. If pixels on the right and lower borders cannot fit in full sized tiles they are dropped. Another drawback with this script is that it does not resize the image canvas. You have to crop out the scaled image by yourself. The main and philosophical drawback is that the pixel values are converted to the linear scale just for the scaling computation, then they are immediately converted back to the power scale. In a proper system the values should stay in linear scale all the way long till the final encoding in a compressed file format. Sebastian Pipping has made a plugin for the Gimp: http://blog.hartwork.org/?p=1173 . He points out that this is still a prototype; slow and limited. Apply to the image the filters and operations you intent. A lot of websites use php and gd2 to make thumbnails. 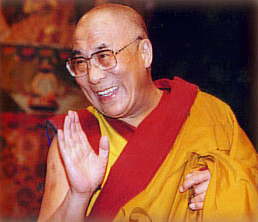 GD2 uses the wrong scaling and the Dalai Lama image turns grey. Luckily gd has an imagegammacorrect function. Below is a commented sample of how to use it to do better scaling. I wish to thank for their help, support and advice Dimitri Gathy, Vincent Minder and Frédéric Cloth. Many thanks to Frank Peters for revealing the Netpbm toolkit to me. Thanks to Sam Hocevar for the dithering examples. Thanks to Øyvind Kolås for pointing to the GEGL software. Thanks to Dustin Harman for seeing the digg.org typo. Thanks to David Greenspan for pointing to the need to add images calibrated for Macintosh computers. Thanks to Jerrad Pierce for the better English wording. Thanks to Chris King for the chained ImageMagick command. Thanks to Rylee Isitt for the procedure and details about Photoshop CS3. Thanks to Derek Hofmann for suggesting to show the image scaled by the browser. Thanks to Michael Vinther for reporting Image Analyzer. Thanks to Simon Lundberg for reporting Aperture 1.5.6. Thanks to Joe Davisson for the good news about Rendera. Thanks to Don Eddy for the good news about Adobe Photoshop Lightroom. Thanks to Giovanni Bajo for mentioning the possibility to speed up the calculations. Thanks to Ron Coy for the good news about Pixelmator. Thanks to Jean-Marie Pichot for the good news about Paint Shop Pro X2. Thanks to Francesco Bellomi for the good news about the Preview app in Mac OS X 10.6 and probably the whole of Mac OS X 10.6 since the "Core Image Fun House" app behaved correctly. Thanks to WormSlayer for sending the picture with the green lines artefact, by Photoshop. Thanks to Daniel Felps for allowing me to understand that the green lines artifact in the Photoshop and Firefox are probably due to the antialiasing filter that is being used before the image is downsampled. Thanks to Jared Earle for reparting that the Lanczos algorithm in the Acorn app is correct. Thanks to Mark Visser for explaining to me how the gamma is coped with in the VFX industry. Thanks to Ryan Raner for reporting that 32-bit images in Photoshop CS4 too are handled properly. Thanks to Peter Schamerhorn for the good news about Corel Photo Paint X4 provided 32-bit depth is used. Thanks to Scott Brikey for the sending the scaled image by MSPaint. Thanks to Justin Williams for the good news about Photoshop CS4 64bit and that 16 bit depth does the job, and for the examples of special cases. Thanks to Roy Hooper for the good news about Adobe Photoshop Lightroom 2. Thanks to Ananth Deodhar for the good news about Deodar Quark XPress 7.0 and 8.0. Thanks to Paweł Kaczor for reporting that the sips command in Mac OS X does not yet scale correctly. Thanks to John Cupitt for pointing out the philosophy behind Nip2. Thanks to Steinar H. Gunderson for the explanations about sRGB, YCbCr and JPEG. Thanks to Daniele De Felice for pointing out Firefox. Thanks to Karel Kulhavy for pointing out that Links did it the right way. Thanks to Gokhan Unel for reporting about Aperture 3.0. Thanks to Albert Cahalan for the good news about Tux Paint. Thanks to Mike Brady for reporting on ACD Canvas X and Paint.NET. Thanks to Andrew Penry for the explanations about PHP. Thanks to George Kourousias for reporting about Python Imaging Library, ITT IDL and ImageJ and for the pertinent remark on scientific imagery. Thanks to Stu Krone for pointing out that Lightroom is correct under Windows too. Thanks to Erik Krause for the link below. Thanks to Jürgen Eidt for the good news about cPicture. Thanks to Thorsten Lemke for the good news about GraphicConverter. Thanks to Carmine Paolino for precisions about Preview and Pixelmator and the nice Acorn snapshot. Thanks to Kurt Roeckx for the link towards the Poynton article. Thanks to dos386 for pointing out that sRGB should be put forward, that the formulas or not exponentials but powers, for the news about XNview/NConvert and Opera and for pointing out that the reason why simple browsers did not scale the pictures is that I was using fancy new HTML/CSS style tags. Thanks to Joey Liaw for the remark about 3D applications and the link. Thanks to Igor Lopez for the good news about Bibble 5. Thanks to Konstantin Svist for reporting that Kolourpaint is not gamma-compliant. Thanks to Ben Chamberlain for pointing out the need to use -resize instead of -scale for ImageMagick and the information loss when working on a 256-color grayscale image. Thanks to István Kovács for the good news about RawTherapee. Thanks to Thorsten Kaufmann for the good news about NUKE and pointing to the pages written by Bill Spitzak. Thanks to Sebastian Pipping for pointing out the problem with the Lua routine, for creating a plugin for the Gimp and for proposing a patch for the Gimp. Thanks to Konrad Milczarek for the links towards the colospace tag in ImageMagick and about ResampleHQ. Thanks to Yongwei Wu for the feedback about Mac OS X. Thanks to Anthony Thyssen for the explanations about the -colorspace parameter. Thanks to Waken for pointing out a dead link. Thanks to Johannes Huter for the good news about IrfanView. Thanks to Sebastian Geerken for the good news about Dillo. Thanks to Rafa for the good news about SAR Image Processor and about the LAB colorspace in ImageMagick. Thanks to Michiel Verkoijen for the good news about TinyPNG. Thanks to Leo Bodnar for the address of his page. Thanks to Rudolf Eyberg for the links about resizing techniques and companding. Thanks to Jonathan Carroll for the image with the dithered scales. Thanks to Johnny Johansson for the good news about Gimp 2.10. 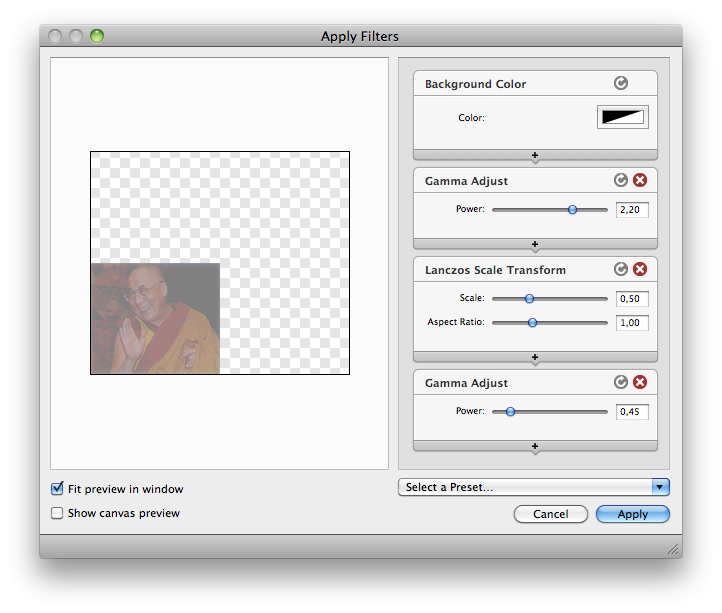 Left, Nathan C. Matthews managed to reconstruct the image of the Dalai Lama, using filters in Photoshop. In the middle, David Ellsworth used FFT filters and the Dalai Lama picture intended for TFT displays. On the right, the original image I used. www.imagemagick.org/Usage/resize/#techniques explains quite good the options with linear transformation RGB, LAB, LUV, Gamma or sigmoidal. All product names mentioned are registered trademarks of their respective owners. The computer scripts I wrote for this page are under GNU GPLv3 license.